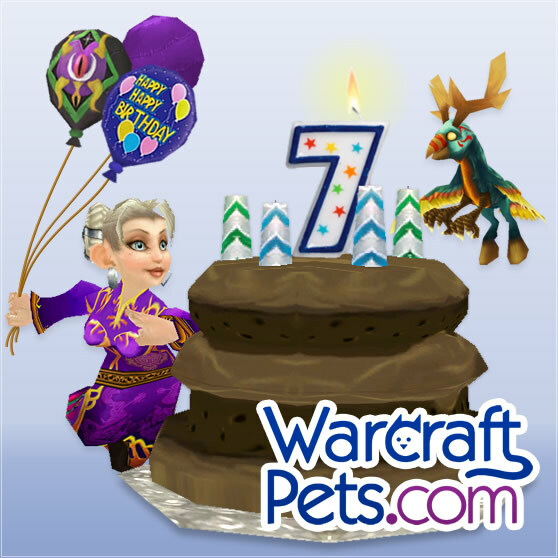 Happy 7th Birthday to WarcraftPets! It's been seven incredible years since WarcraftPets launched, dedicated to bringing you everything pet-related. And today we're celebrating our 7th birthday! More than 50 new pets! Added more site tools to help with your collecting and battling needs — pet maps, scaling stat calculator, smart pet search, new filters. Introduced a site-wide ranking system and overhauled the Best Battle Pets page and the pet rating system. The WarcraftPets Meet and Greet at Blizzcon 2013 was a blast; "Crazy Cat Lady cookies" were a perk! Doobjanka celebrated his four year anniversary here at WarcraftPets by giving away two Murkablo pets. Community Spotlight was unveiled, and showcases our awesome community creations. Our first Pet of the Month went up, with accompanying forum discussion thread. Our sixth April Fool's Day joke—gave us a chuckle and Blizzard seemed to enjoy it too!